For years, the corner of Francis and William Streets was home to a sprawling behemoth of a cafe, called Vultures. 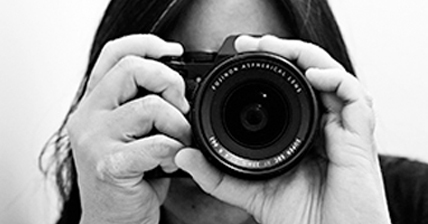 I was studying at university and working casual hours at a restaurant on Beaufort Street in Mount Lawley. Vultures was one of a few regular haunts for my friends and me – somewhere to unwind after knocking off work at 2am on Friday or Saturday. It was noisy, crowded and teetered on the edge of chaos, but we always had a good time. We’d debrief over drinks and enormous plates of nachos until sunrise, when we eventually tumbled back home. Back then the nightclub opposite Vultures was called Aqua, and there was a perpetual line waiting to get in. During the day, I had a decent feed at Vultures with mates and family on a number of occasions. After Vultures closed down, its successor the Bell Tower Restaurant and Bar never really made its mark before also disappearing into history. 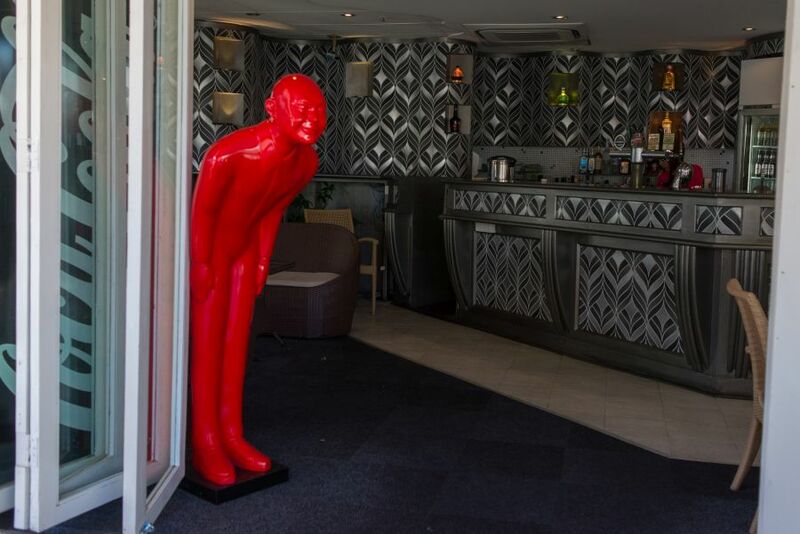 When the empty shell of a restaurant began to show signs of life again some months ago, we noticed, and were curious. When the scrolling neon sign in the window began displaying the magic words “24 hour pho” recently we were excited. What a great idea! We’ve been referring to it ever since as “The 24-hour pho place”. To test-drive a 24-hour cafe, you really want to go late at night or early in the morning, not at regular lunch and dinner times. But Jac and I are old farts now and don’t tend to be out and about looking for grub in the wee hours with all the cool kids. We decided to take a drive to Northbridge on Easter Monday morning to test U & I Cafe’s Night Menu which is available from 10pm to 10am daily. 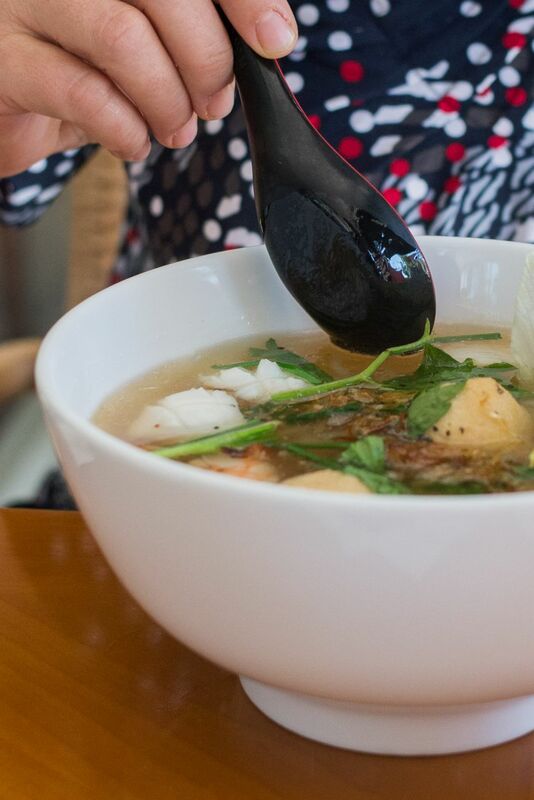 It was 8am and a hot, hearty Vietnamese breakfast in a bowl sounded great to us. 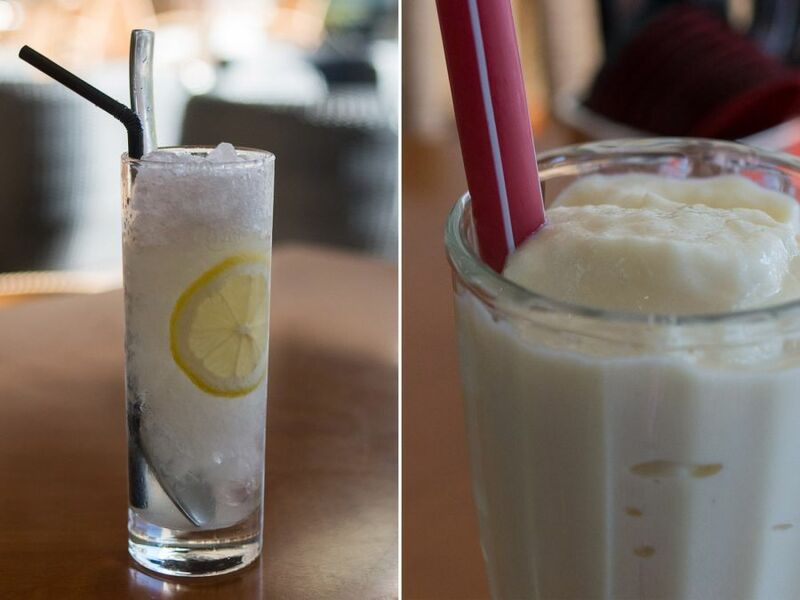 First, drinks – I’m always excited to see anything durian on the menu – I ordered a durian milkshake, while Jac got an iced lemon juice. My durian milkshake was visibly thick and creamy and nostril-flaringly whiffy, to my delight and Jac’s disgust. 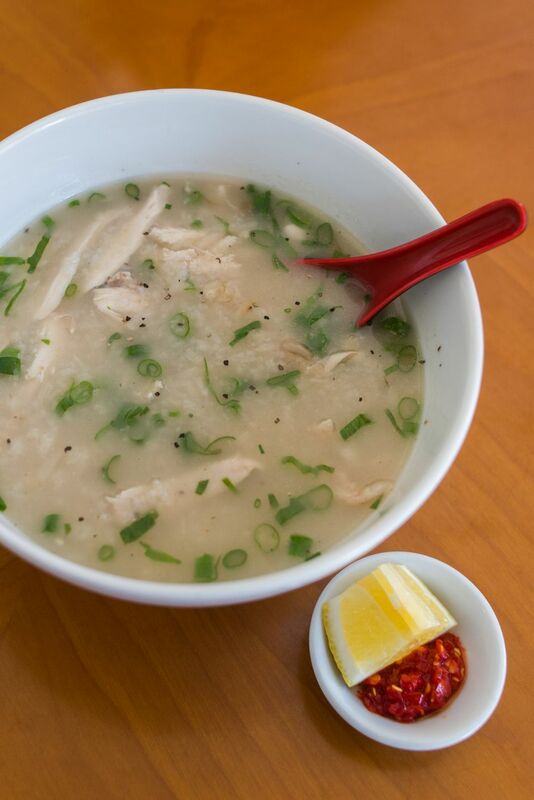 Despite ordering a entree to share for our starter (and using those words when we ordered), the first of the food to arrive was my Chao Ga – chicken porridge (AU$12). It baffles me why some restaurants (not just U & I) bother distinguishing between entree and main course on the menu if they won’t make the effort to send them out in order. My porridge looked dubiously watery but a quick stir and taste revealed a delicious, nicely seasoned rice porridge with an abundance of boneless shredded chicken. I could eat this for breakfast regularly. 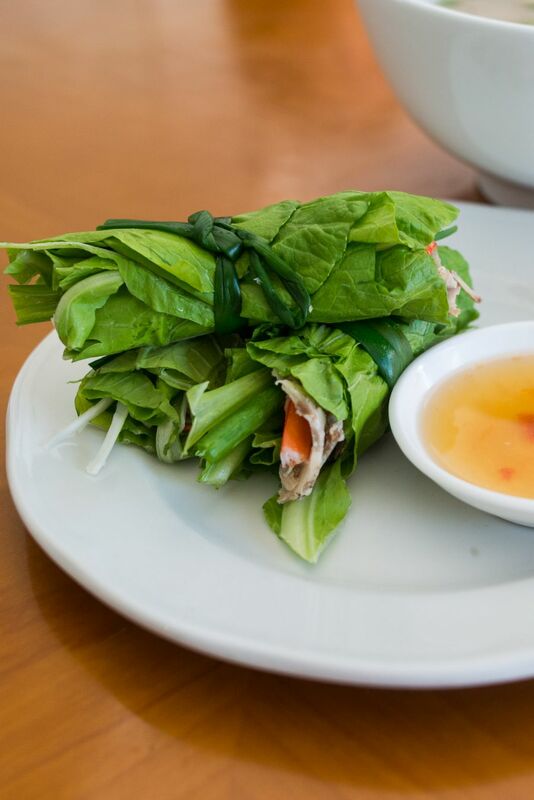 Next came the ‘starter’ dish: Goi Cuon U&I – prawn and pork with salad wrapped in green leaves (AU$6.50). 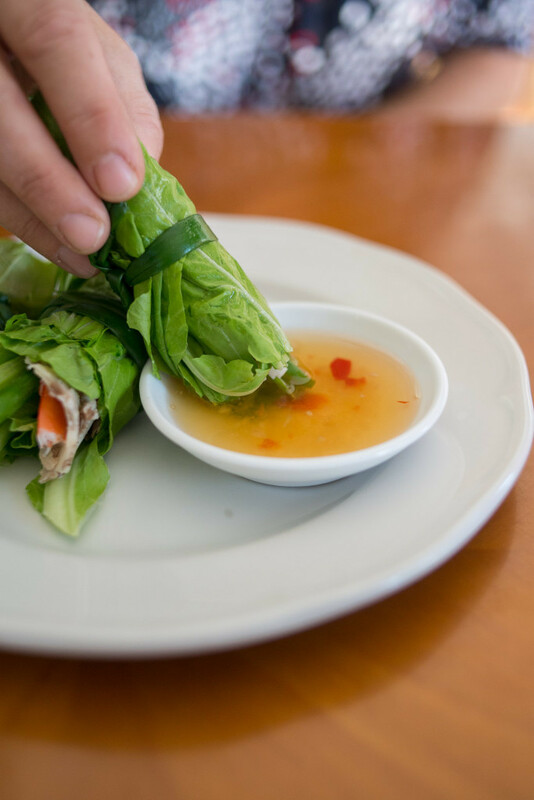 The green leaves are quite substantial and slightly bitter – most people would never crave to eat them raw on their own – but wrapped around sliced cooked pork and prawns and dipped in nuoc cham, they make surprisingly tasty morsels. The spring onion-tied bundles fall apart and get tricky to eat after the first bite especially once you’ve chewed through the spring onion tie so it’s best to keep it to two big bites. 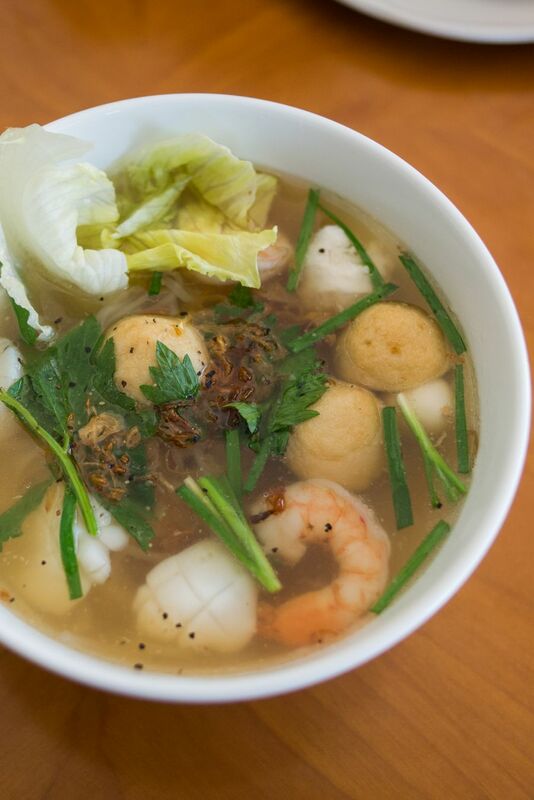 Jac ordered Hu Tieu Do Bien Nuoc – rice noodle soup with seafood (fish balls, squid and prawns), bean sprouts, chives, celery, onion and coriander (AU$12). The broth was tasty, but there was no coriander. It was a big serving; just as she was about to push her bowl away and admit defeat, Jac found a lone quail egg hidden beneath the last of the noodles (she ate it, of course). “The 24-hour pho place” should be a winner but so far the feedback I’ve seen reflects inconsistent service and less than stellar experiences. There were no catastrophes for us, although a waiter tried to serve us someone else’s beef pho. She would’ve left the bowl at our table and walked away despite our saying “We didn’t order this. We ordered seafood – this is beef” – eventually removing it when a second staff member came over to see what all the kerfuffle was about. And while we were finishing our meal, a table of four waited nearby, visibly fidgeting and looking around for a staff member to return and take their order, but it seemed no one would catch their eye (that old classic symptom of bad service) – very frustrating as there were less than half a dozen tables of customers and three floor staff on duty. We enjoyed our food and will probably return at some stage to try the Day Menu, though we won’t be rushing. 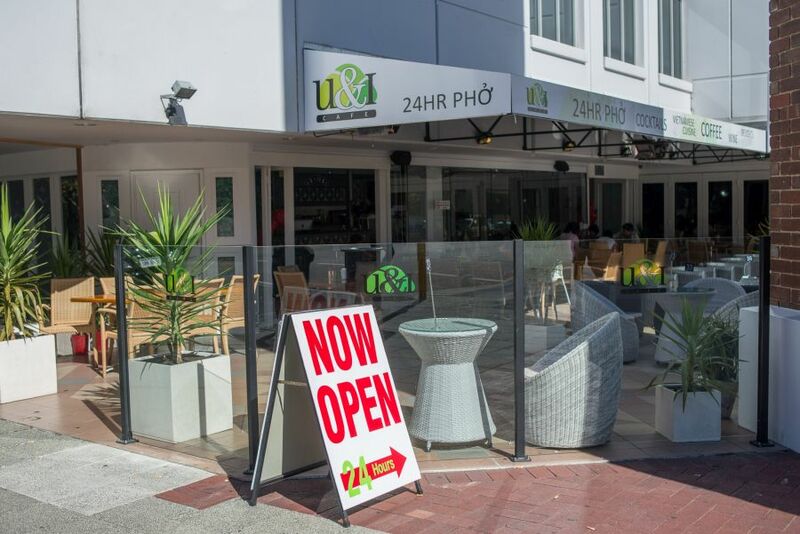 I’m thrilled that we now have 24-hour Vietnamese food in Northbridge, but frankly, it will take more than the lure of an all-hours kitchen to make the most of that great location. 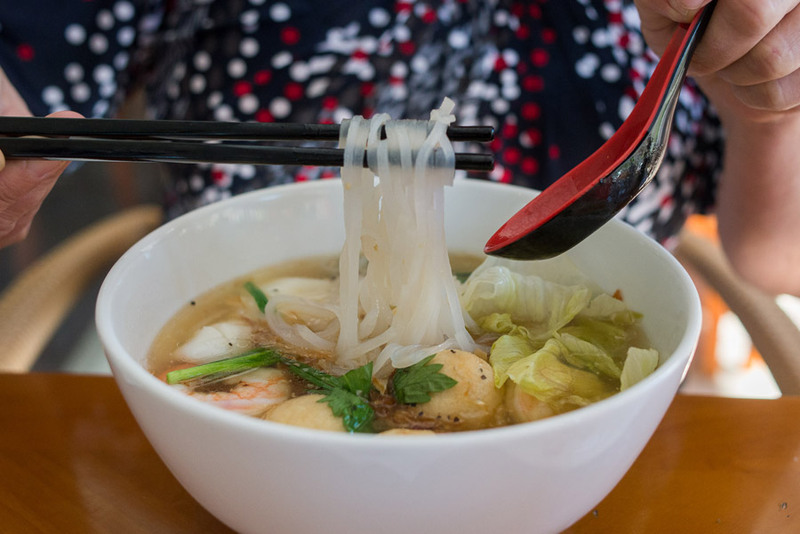 At lunch and dinner time when all the neighbouring dining options are available (including Phong Vinh and Viet Hoa not so far up the road) and the most punters are out and about looking for a feed, U & I will need to do better if they are to compete.